Bihar is located in Eastern part India, bordering Nepal. It is divided by the River Ganges. Patna is the capital of this state. It has numerous educational institutions along with some private and government universities. It has also one of the IITs. Most of the candidates came here for accessing higher education from different places. This state has the literacy rate of 63.4 percent. 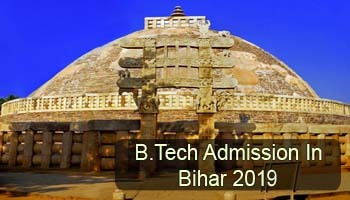 In this article, candidates can get the complete information related to the B.Tech admission in Bihar 2019. Admission in the undergraduate engineering programme (B.Tech) will be offered through state level or national level entrance test. The admissions will be done on the basis of the candidate’s performance in the entrance exam. On clearing the entrance test, candidates have to appear in the counselling round for the allotment of seats. In the state of Bihar, admission into engineering courses is done through state level and national level entrance exams. BCECE is the state level entrance exam and JEE Main 2019 is the national level entrance exam through which candidates can get admission. For admission into IITs and NITs, candidates have to appear in JEE Main Exam. BCECE 2019 will be conducted by the BCECE Board. For admission into the M.Tech course, Candidates can appear in GATE 2019 exam. Bihar is the house for various top reputed engineering colleges. It has many famous colleges like Indian Institute of Technology Patna, Birla Institute of Technology Patna, National Institute of Technology Patna, etc. Candidates those seeking admission through entrance test must meet the eligibilities given below. Candidate should pass 10+2 or its equivalent examination from a recognized board. Candidate should pass the Intermediate with Physics, Chemistry, Mathematics and English subjects. Candidates should obtain a minimum of 50% marks (45% in case of reserved categories). Candidates those will be qualified in the entrance exam can participate in the counselling. For admission into various engineering colleges, the admission will be provided on the basis of score card of JEE Main and BCECE. Candidates have to verify their certificates either online or offline mode according to the concerned authority. The seats will be allotted on the basis of candidate’s rank, filed choices and availability of seats in the participated colleges. After receiving the provisional seat allotment letter candidates can report to the allotted college for the final admission. Candidates can participate in the counselling on producing the certificates given below. Candidates make sure that the documents should be produced in original along with one set of photocopy. If you have any other queries about B.Tech Admission in Bihar 2019, you can write your queries in the comment box given below. Bihar engineering me admission ke liye form apply kab se aur process kya hai. sir,b.tech ka counseling kb hoga. aur sir agr hm b.sc me admission leliye aur b.sc se name ktwa kr b.tech ke counseling me aane ke lie kya karna hoga 24 tk date h sirr admission ka b.sc ka..
Can other state candidate apply in Bihar b.tech in general category? Application date clear kre please.